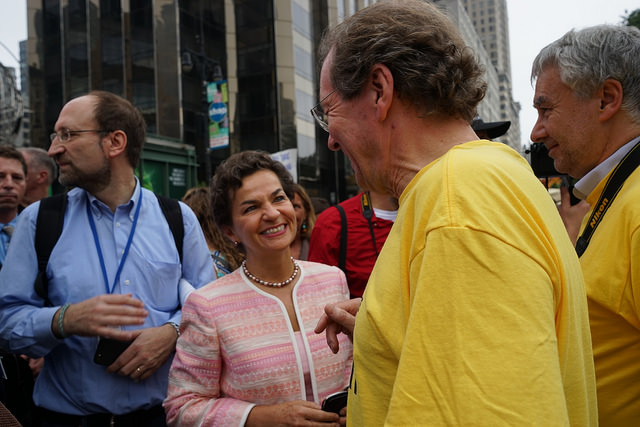 At the Climate Summit 2014, world Mayors marched the streets of New York and unveiled new initiatives that will catalyze climate action globally. 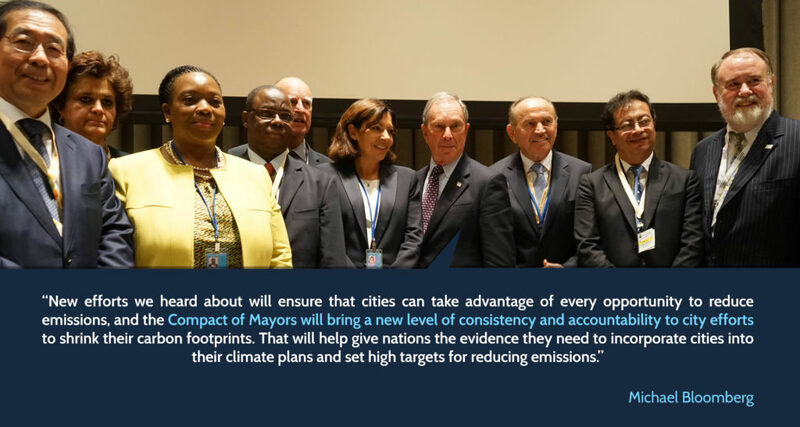 These initiatives – including the historic Compact of Mayors – show the solidarity, leadership and commitment of cities to fight climate change at full speed. 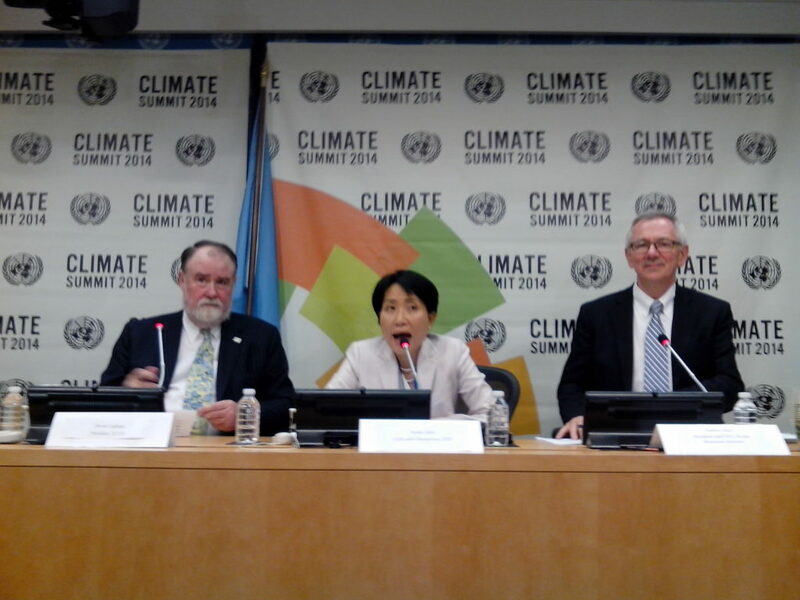 “The Climate Summit 2014 marks a new peak in the journey of globally coordinated local climate action. This journey started two decades ago with the first world meeting on climate change for municipal leaders, and is continuously progressing and reaching new heights with bolder leadership, higher ambitions and stronger solidarity. We, ICLEI, together with our cities and partners, are committed to act urgently and cooperate intensively to help ensure that we reach a meaningful climate agreement”, said ICLEI Secretary General Gino Van Begin. 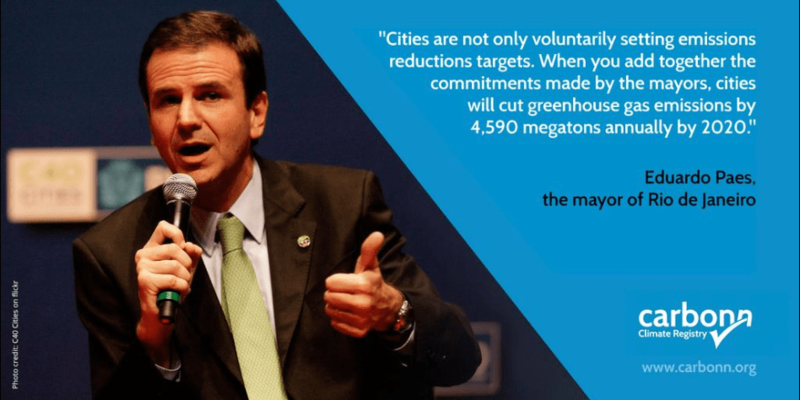 ICLEI, together with C40 and UCLG, launched the Compact of Mayors – an unprecedented initiative that aims to consolidate and amplify cities’ commitments to cut emissions, measure progress and prepare for the impacts of climate change. Under the Compact of Mayors, cities will report their climate commitments, actions and inventories on existing reporting platforms which will be linked to the central repository carbonn Climate Registry– the world’s leading reporting platform for local and subnational climate action. According to new research, existing city commitments alone could reduce annual emissions by 454 Megatons CO2e in 2020 – a total of 13 Gigatons CO2e by 2050. Under the Compact, these numbers could be doubled, quadrupled or multiplied many times over. Seoul Mayor Park Won-soon, Brazilian Environment Minister Isabella Texeira, Kwazulu-Natal MEP Nomusa Dube, Ghana MEP Edem Asimah, California Governor Jerold Brown, Paris Mayor Anne Hidalgo, UN Special Envoy on Cities and Climate Change Michael Bloomberg, Istanbul Mayor Kadir Topbas, Bogota Mayor Gustavo Petro and ICLEI President David Cadman at the Cities Action Session. 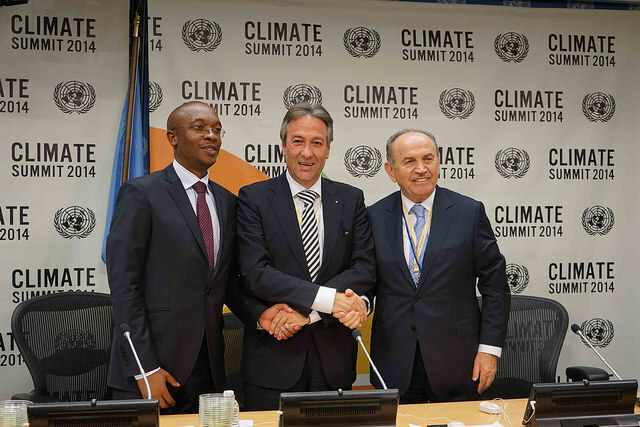 The Climate Summit also marks a new era of collaboration. Be these city-to-city, city-to-business, city-to-nations, city-to-regions – partnerships are arising from all nooks and corners of the world, and from all kinds of groups, industries and stakeholders. These partnerships are crucial in achieving a meaningful cut in the global GHG emissions. The Summit also saw new cooperative efforts to build resilience, promote sustainable mobility, foster energy efficiency, clean air, manage solid waste, unlock finance and put a global price on carbon. Each of these initiatives is born out of an unprecedented collaboration among cities, and will add critical support on the collective road to Paris in 2015. At the Cities Action Session during the Summit, representatives from local governments discussed all these critical issues and pledged to step up their efforts. On this front, ICLEI endorsed 8 Action Statements, namely the Compact of Mayors; City Climate Finance Alliance; Climate and Clean Air Coalition – Municipal Solid Waste Initiative; Resilient Cities Accelerator Initiative; Sustainable Energy For All – Global Energy Efficiency Accelerator Platform; Urban Electric Mobility Initiative; World Bank “Putting a Price on Carbon” Statement; Joint Statement of Non-State Actors. Additionally, ICLEI participated in three Policy Dialogues: Sustainable Energy for All Policy Dialogue; Resilience Policy Dialogue; and the Cities Policy Dialogue. 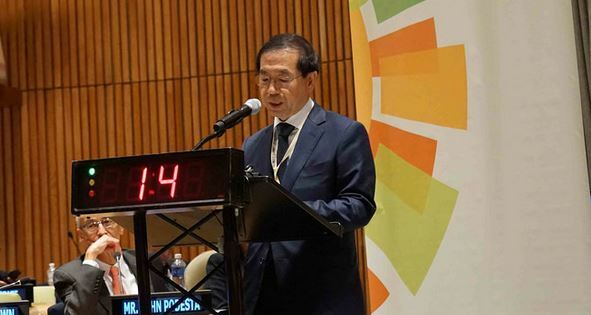 Seoul Mayor Park Won-soon remarked, “If we are to bring down global temperatures, we must step up, scale up, speed up local climate action globally. Together, let’s innovate, integrate, collaborate!” Read Mayor Park’s full speech. “Humanity is facing an existential crisis and it was caused by us. 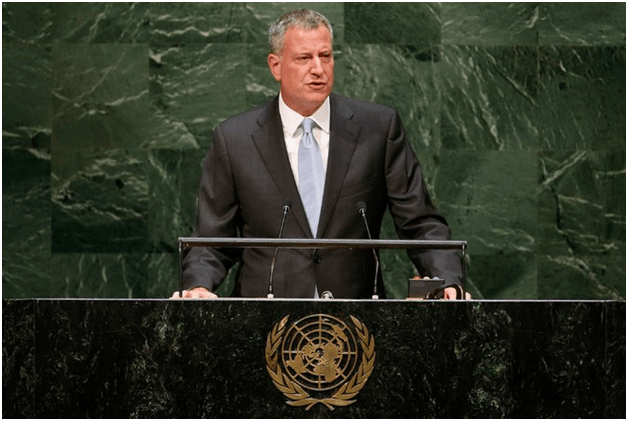 We have only one choice — urgent, daring action” said New York Mayor Bill De Blasio, during his speech at the opening ceremony. 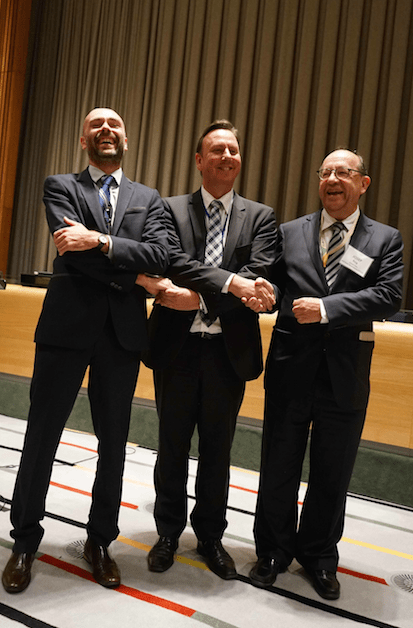 C40 Executive Director Mark Watts, ICLEI Secretary General Gino Van Begin and UCLG Secretary General Joseph Roig demonstrate the power of collaboration. 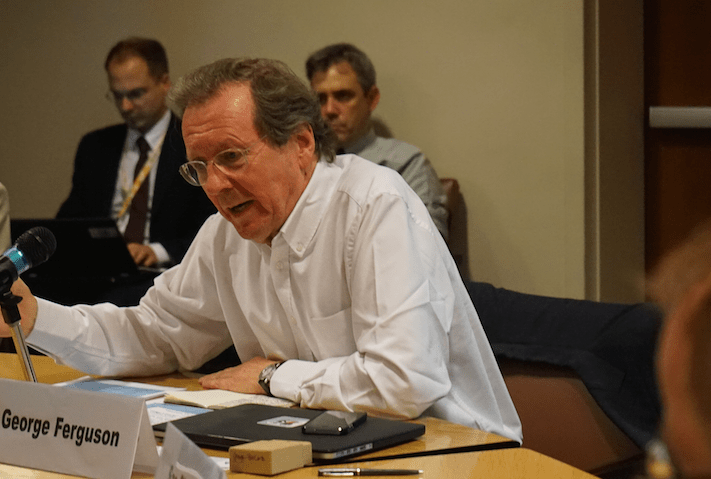 At the GEF press conference launching their new programs dedicated to sustainable cities, ICLEI President David Cadman remarked that, “We need multipliers now to accelerate actions in cities, ICLEI is ready to lead that”. 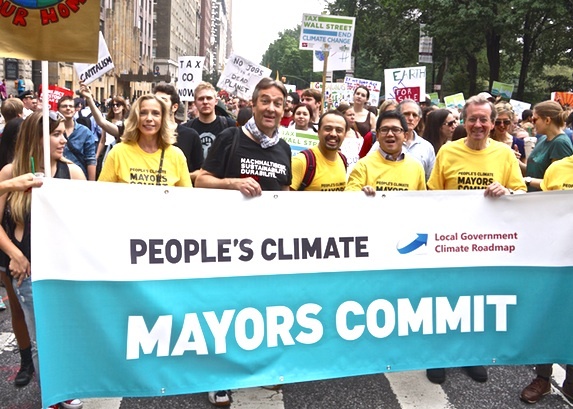 Bringing the voice of local governments from the streets to the UN, the ICLEI-led delegation of Mayors joined 600,000 people marching for climate action, under the slogan, Peoples Climate, Mayors Commit. 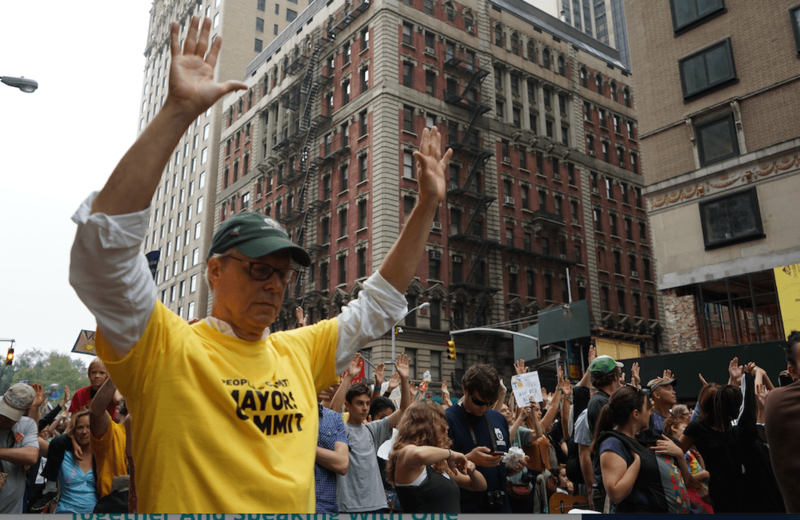 The march is the by far the biggest grassroots demonstration for calling for climate action. Only when we move, we can move the world, said Mayors George Ferguson (Bristol, UK), Herbert Bautista (Quezon City, Philippines), Jürgen Nimptsch (Bonn, Germany), Frank Cownie (Des Moines, USA) who joined the biggest demonstration of climate action. “We have to do what we can, as mayors, to save the world”. Frank Cownie, Mayor Of Des Moines, Commits To Local Climate Action! See his video here. 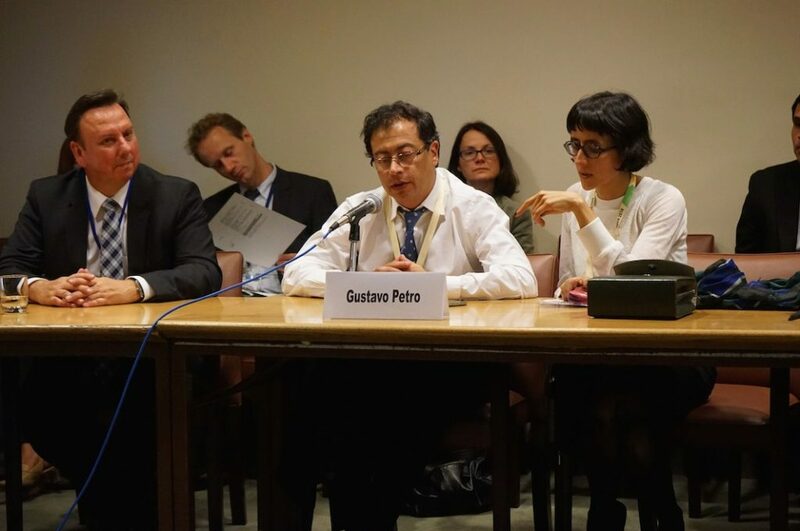 Bogota Mayor Gustavo Petro remarked that “The City of Bogota provides an exemplary example of the significant global impacts of local action. Our Bus Rapid Transport system has achieved carbon emissions reductions of some 350,000 tonnes annually. It is the first major transport scheme in the world to earn Kyoto carbon credits. The Compact of Mayors could be exemplary for the rest of the world – and which could support the efforts of cities to construct together a better future scenario for generations to come”. 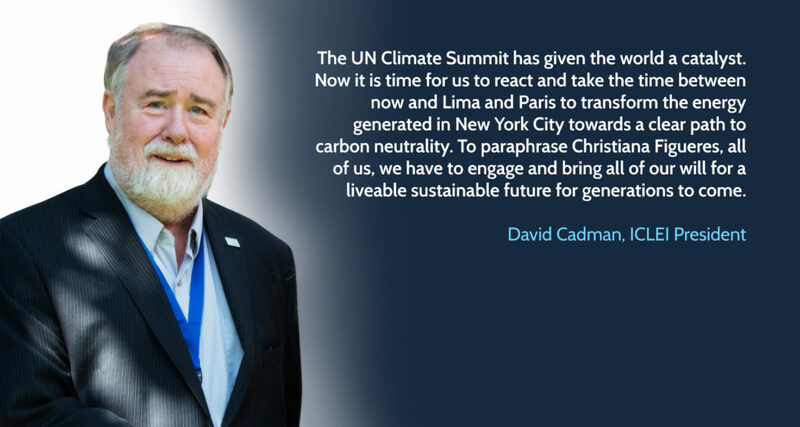 ICLEI President David Cadman summarizes ICLEI’s activities in New York, ” The UN Climate Summit has given the world a catalyst. Now is the time to react and take the time now between now and Lima and Paris to transform the energy generated in New York City towards a clear path to carbon neutrality. To paraphrase Christiana Figueres, all of us, we have to engage and bring all of our will for a livable, sustainable future for generations to come”.